The FB post a few days ago about the Siberian worms (nematodes) that revived after 30k years in permafrost made me remember, back in my teaching days, of seeing similar-looking horsehair worms (or having students bring them in for extra credit). They were rather common around farms and wet margins of yards. Often they’d be found in a tight ball resembling the mythical Gordion Knot, giving them one of their common names. They are not nematodes, but superficially resemble them and are in their own Phylum, Nematomorpha. There are some 300 species; some grow to more than six feet long–far in excess of the length of their host grasshopper et cetera. 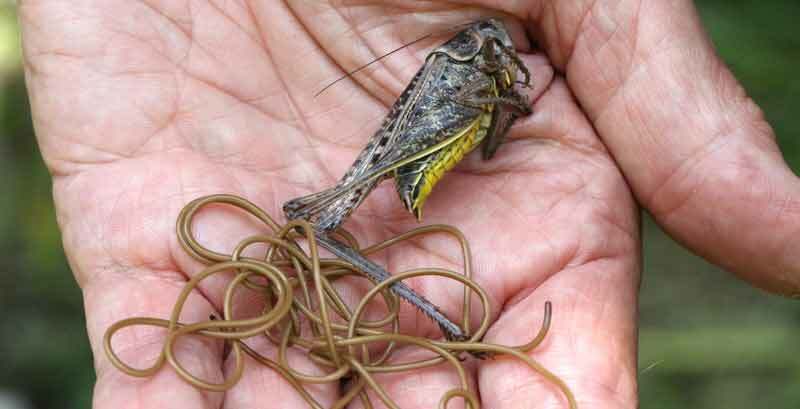 They are very simple creatures but can have complex life cycles—including the zombie effect of making a host beetle or grasshopper commit suicide by jumping into water, since this is necessary to complete the worm’s life cycle. And no, they do no harm to humans—except weird them out. It is freaking to hold one of these in your hands—like a stiff animated strand of the world’s strangest pasta noodle. If you have seen these before, please tell me if it was recently and in what kind of habitat. Did you identify the host that filled the role that you see in this video of three large worms emerging from an unfortunate praying mantis? Well, that was enlightening, but the yuk factor was pretty high for me!